Pogba and Shaw were among the goals, but who else were the standout performers? 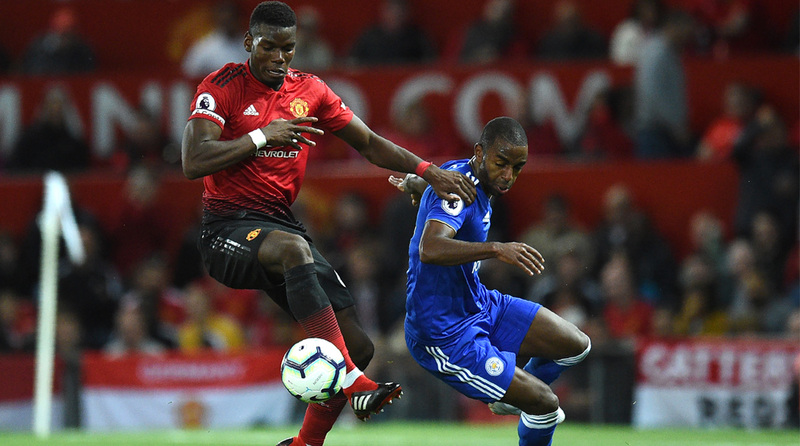 The 2017/18 Premier League season got underway with Manchester United vs Leicester City on Friday night, with the Red Devils running out 2-1 winners at Old Trafford. Goals from Paul Pogba and Luke Shaw, either side of the interval, had given the hosts a 2-0 lead before a late strike from substitute Jamie Vardy made it a nail-biting finish for the home fans. After some anomalies at the World Cup, back to the regular jaw-dropping stuff from the Spaniard. His first-half save from James Maddison was something else and he was arguably the busier of the two custodians. Great to see the 23-year-old score his maiden senior goal. Thoroughly deserved after his runs down the flank all game long. Still got a bit of work to do on the defensive aspect, but very promising outing. United’s best defender, when fit. Took Iheanacho out of the game with ease. Did slip up at the death to allow Vardy to score, but on the whole, was a rock at the back. First game with his Ivorian teammate and the Swede picked up where he left off for his homeland at the World Cup. Calm and composed with and without the ball. Struggled to cope with Gray’s pace and trickery all night, but kept to his man gamely. Tough first outing as while he did make some excellent passes to the wing, he made a hash of some simple ones as well. Lucky not to get sent off after he escaped a caution for a stupid foul in the first half. Started off well enough but couldn’t quite keep up the tempo. Let’s put it down to a World Cup hangover, but fans will want more from the talismanic midfielder in the weeks to come. Easily the standout outfield player for United. Kept things ticking for United and hardly gave the ball away, even when surrounded by opposition players. Positioning was top notch as well. Too many passes that didn’t quite have the right amount of weight on them, but the diminutive Spaniard was bright. Did manage an excellent assist for Shaw’s strike. While he did effectively win the penalty, but it didn’t quite click for the Chilean from there. Too many misplaced passes and while he did set up Lukaku and Mata for promising chances, the No.7 needs to do far, far more. Put in a shift, but never quite looked like he’s got the technical quality to lead the line for United. Was lively after coming on but missed a real sitter after Sanchez put him through. Came on in place of the fading Fred as Mourinho sought to see the game out. Replaced Pogba with just six minutes of regulation time left. Didn’t have much to do, apart from potshots from distance. Considering he guessed the direction of Pogba’s penalty, maybe could have done better but was not at fault for Shaw’s goal. Kept his side in the tie with a massive save from Lukaku late in the second half. Combined well with Gray on the left flank to cause Darmian all sorts of problems. Shackled Rashford fairly well and played like a man in demand. Strode out of defence with the ball at his feet on a number of occasions. The veteran just about held his own against Rashford. It was instinctive probably, but it was still a stupid mistake and effectively cost Leicester the draw and perhaps, three points. Did okay after the handball, but the damage was done. Decent game from the Portuguese midfielder even if he was unable to penetrate United’s defence. Shielded his defence family well, but most of that was due to United’s lack of endeavour after going ahead. Among Leicester’s brightest outlets, kept probing right till the end. Regularly beat his man on the wing. Found the going tough on his Premier League debut, but was unlucky not to score when he caught the ball so sweetly. Excellent cross in between the defence to set up Vardy, but despite Shaw leaving holes on his flank, couldn’t quite take advantage. Still, a pretty decent Premier League debut. Poor outing from the former Manchester City man. Had a point to prove with Vardy on the bench, but couldn’t quite best Bailly and Lindelof. Two chances, one goal. That’s a top-drawer poacher for you. With limited time, it was always going to be difficult for the Algerian to make an impact, but expectations are high for he’s replaced a man who departed a club icon. The burly Spaniard came on looking to do a Fellaini but didn’t get a sniff of the ball.